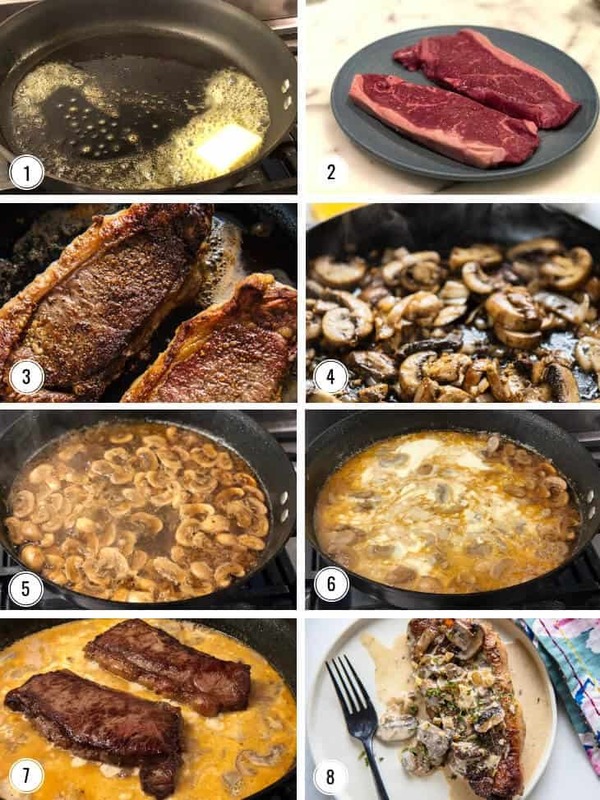 A tender, juicy skillet steak smothered in a mouthwatering mushroom cream sauce that comes together in just 30-minutes. 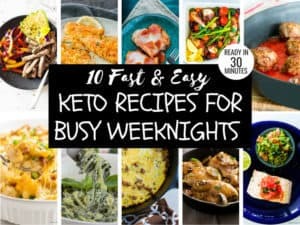 This easy recipe has something for everyone – whether ketogenic, low-carb, gluten-free or none of the above! 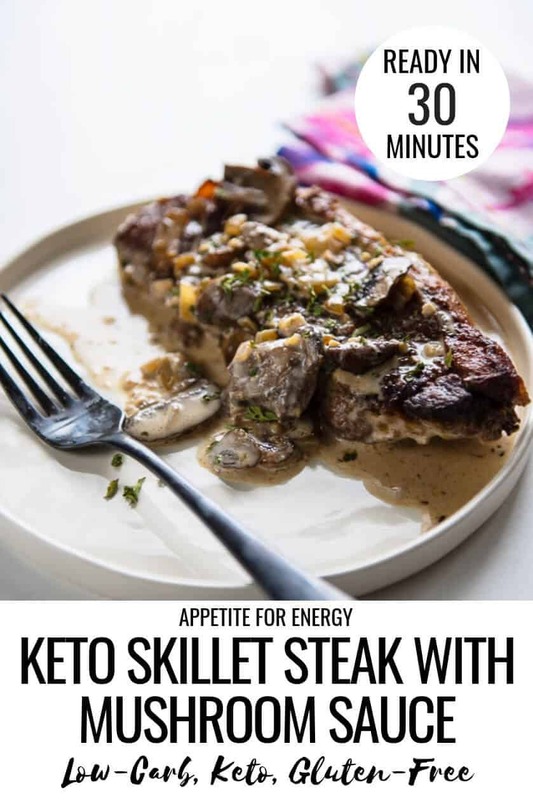 Recipes like this easy low-carb skillet steak with mushroom sauce are the reason why so many people are attracted to the ketogenic diet. 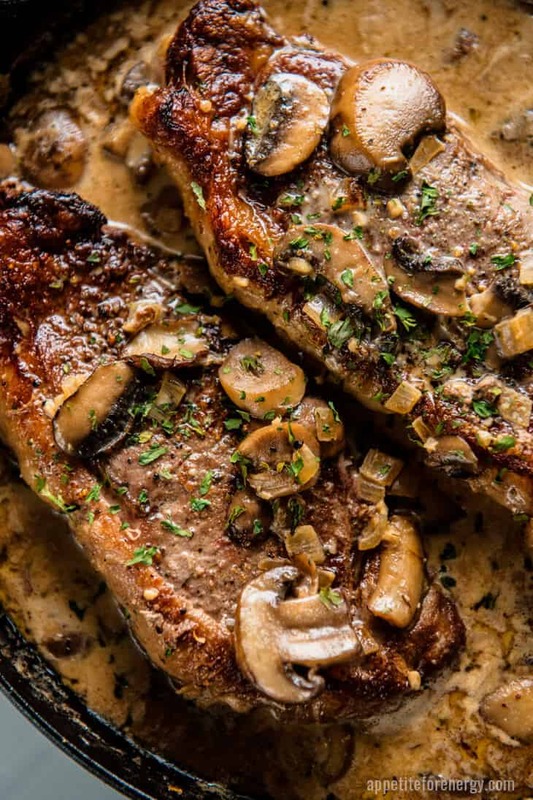 Who can say no to a juicy, seared piece of strip steak, smothered in a rich, mushroom sauce? There’s no starving or feeling deprived going on with this recipe! 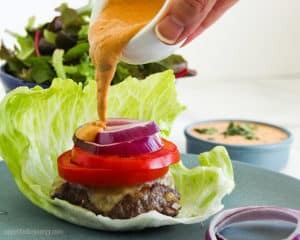 Comfort foods like this steak dinner, and our Low-Carb Cheeseburger Soup are rich, creamy and just wrap you up in flavor. One-pan – less washing up! 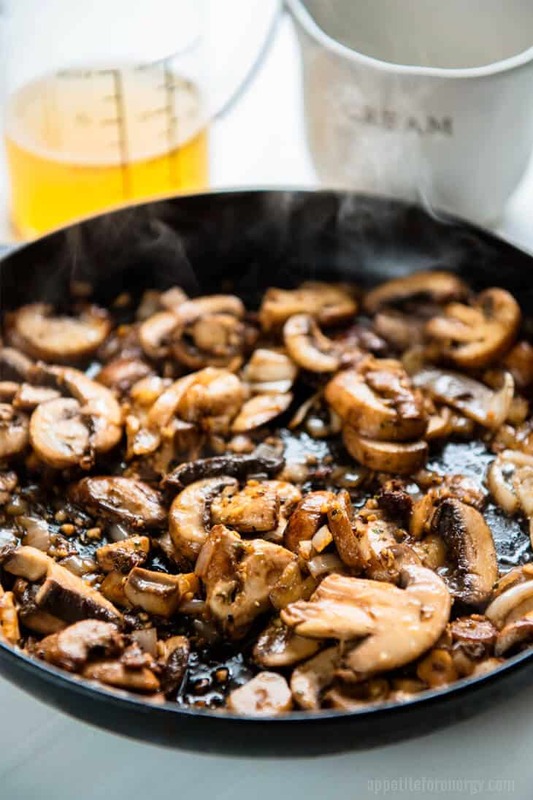 Flexible – the mushroom sauce recipe can be used with chicken, pork or white fish providing lots of meal options. Too much sauce? This recipe makes a generous quantity of mushroom sauce. If you won’t use it all, if serving children for example, reduce the amount of cream. Try ½-¾ cup of cream. Leftover mushroom gravy? Keep in an airtight container in the fridge for 4-5 days. The sauce will separate in the fridge so heat gently over medium heat to recombine. The sauce is delicious served with chicken or white fish. Variations? 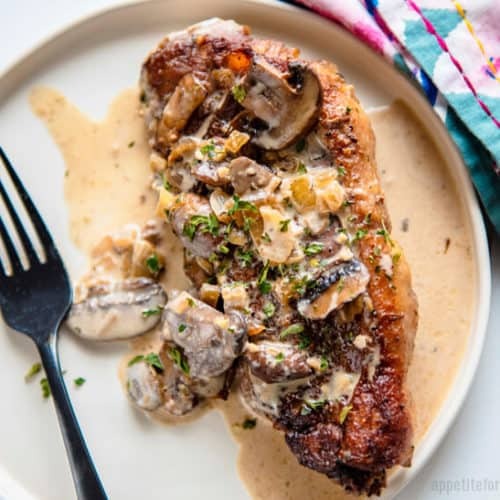 Make chicken with mushroom sauce by replacing the steak with chicken. Brown the chicken first, then add back to the pan after the cream. Cook your chosen cut of chicken until cooked through. It may take longer to cook than the steak. Alernatively, try pork. CAN YOU FREEZE MUSHROOM CREAM SAUCE? Mushroom sauce can be frozen. Allow the sauce to cool to near room temperature and transfer it to a container or a resealable plastic freezer bag. Label the bag with the date and the contents and place in the freezer. If using a plastic bag, freeze on a small baking tray sheet to avoid any spills. CAN MUSHROOM SAUCE BE SERVED WITH CHICKEN OR PORK? Yes, mushroom sauce will be delicious, served with chicken, pork or even white fish. WHAT IS A NY STRIP STEAK? Strip steak is a tender cut of beef from below the backbone. It goes by many names including NY Strip Steak (New York), KC Strip Steak (Kansas City), sirloin in the U.K. and Australia and strip loin in Canada. 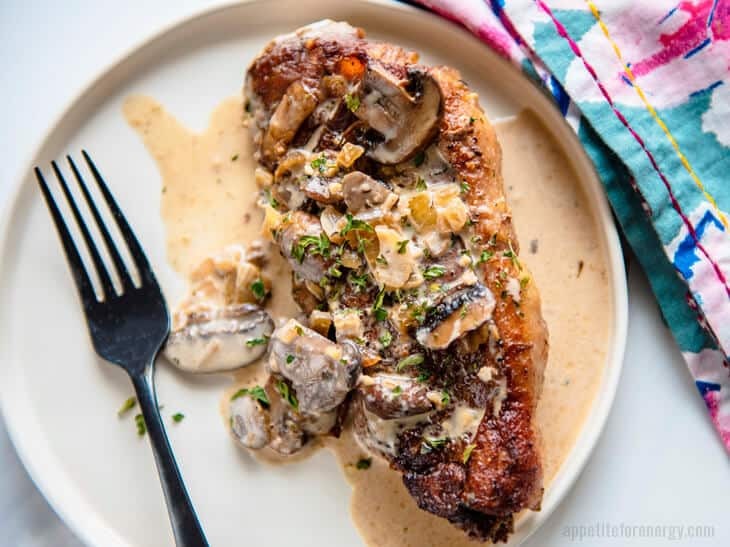 A tender, juicy skillet steak smothered in a mouthwatering mushroom cream sauce that comes together in just 30-minutes. 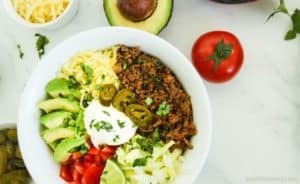 This easy recipe has something for everyone - whether ketogenic, low-carb, gluten-free or none of the above! Too much sauce? This recipe makes a generous quantity of mushroom sauce. If you won't use it all, for example, if serving children, reduce the amount of cream. Try 1/2-3/4 cup of cream. Leftover mushroom gravy? Keep in an airtight container in the fridge for 4-5 days. The sauce is delicious served with chicken or white fish. Oh my goodness! This looks so dang good! This looks delicious! 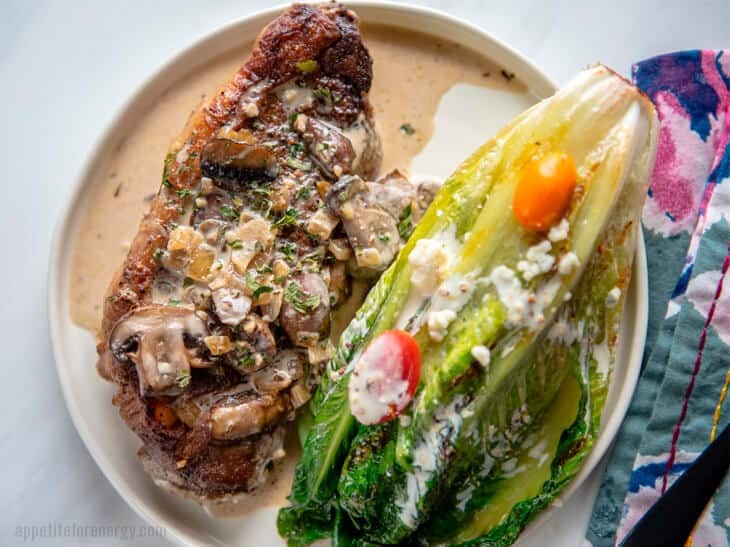 I love mushrooms, and your sear on that steak is perfect! 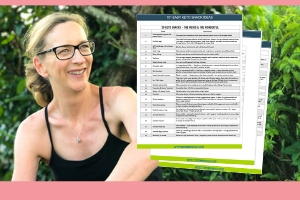 Yes – it is really delicious…enjoy! This recipe looks absolutely mouthwatering! Love that it’s low carb. I bet these steaks are really juicy which is the best way to enjoy them. Definitely, have to try the mushroom sauce. You’ve cooked that perfectly! LOVE all those mushrooms too. If I’m in a pinch would drained canned mushrooms work? I believe that most canned mushrooms are cooked so you could use them but add them later in the cooking process. Try adding them either with the broth in step 7 or with the cream in step 8!